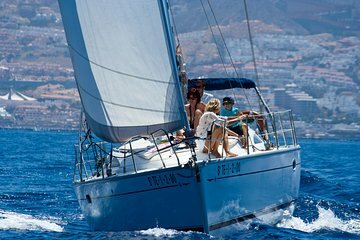 Sail away for a day of luxury, food and fun during this 3-hour sailing excursion from Tenerife. Spend your day swimming, eating and relaxing on board your sailing vessel, enjoying the majestic views of the Costa Adeje and keeping your eyes peeled for marine life like whales and dolphins. Round-trip hotel transport, plus snacks and beverages are included. If you want to further upgrade your experience, an optional celebration package offers paella, Spanish Cava, wine and dessert. The trip was great from start to finish. I am glad we did the trip on the first day, it gave us time to enjoy and take in the scenery before we started our tours and other activities around the island.the skippers were very friendly and informative and did their best to accommodate all.We saw lots of Dolphins and pilot whales which was amazing. This was a very enjoyable excursion in my opinion. Salva came to pick us up from our hotel to take us to the boat. He is a really nice guy and answered all the questions I had about the area and the animals, really good. Whatever you see always depends a bit on luck I guess, but we were able to see the small whales, a big group of uncommon dolphins, couple of kinds of birds and turtles, so I felt it was well worth the money. Then towards the end we stopped and had a swim in the sea, where I saw a few different kinds of fish as well. Also, I thought Salva was a very hospitable man, he is nice and he is always happy to offer drinks and snacks. Also, the excursion included lunch myself and my partner are both vegetarians and it was not a problem at all. We told Salva about it when booked the excursion and he made two cheese and salad bocadillos for us by the way they were very nice!. Finally, they took us back to the hotel after the trip. Summarising, it was all as good as I could have hoped for, I've got no complains at all. If you get travel sickness easily, you might want to get some pills or something, although this depends on how the sea behaves on the day. Gracias por la experiencia Salva, fue genial esto no se ve en Inglaterra y menos aún en Madrid, Tenerife es un sitio precioso. We had a great trip, and were really well looked after. Saw turtles and dolphins. From collection to drop off, everything was spot on. Very pleasant captain and crewman who located the best whale sighting we could of possibly wished for. This is the second time we have been on this trip and it has been amazing both times. It is easy to book, the hotel collection is very well organised, and you are so well looked after on the boat during the trip. The best part is that the hosts are genuinely interested in everything that they are showing you, and have a great understanding and respect of the local environment and amazing animals that you will see. We look forward to doing this trip again on our next visit to the island. Very relaxed enjoyable trip my only complaint is that it was too short! could have stayed longer on the boat. There were 8 of us on the boat with 2 staff who were friendly and helpful nothing was too much trouble. We saw dolphins and pilot whales close up . The lunch was a tasty sandwich , I am a vegetarian I put that on the booking and a separate sandwich was waiting for me so that was very nice . Thoroughly enjoyable trip . Salvadore went out of his way to be the perfect host offering homemade sandwiches and drinks throughout the trip and finding the dolphins and whales preferring to stay away from the other boats . It was amazing to have the yacht to ourselves. Swimming with the turtles was a fantastic experience. This was a 5 star trip and well worth the amount we paid. The pick up and drop off in the beautiful air conditioned car was great too. Haben Delphine und Wale aus nächster Nähe gesehen. Ein großartiges Erlebnis - vielen Dank nochmals an die freundliche Crew Salva und Hans! Ihr macht das richtig toll und ich finde es Klasse, dass ihr euch den Tieren so vorsichtig und respektvoll nähert. Wer gern in großen Gruppen reist und Informationen über Lautsprecher erhalten möchte, der ist hier falsch. Für alle anderen ist diese Bootstour absolut zu empfehlen.